The deities of wind are a changeable bunch. One minute you'll be cruising along smoothly and the next, your sails are flapping wildly while the crew searches below decks for harnesses and life jackets... During such times you'll likely need to decrease the area of the mainsail — known as “reefing” — in order to maintain control of the boat. Don't ignore your instincts — the moment it occurs to you to reef the main is usually the right time to do it. Remember, “apparent wind” feels much lighter when sailing downwind. Since you'll need to reef the sail while heading upwind, it's important not to underestimate its power. Listen to your local weather report. Not just the temps and rain forecast; keep an ear out for the wind forecast. 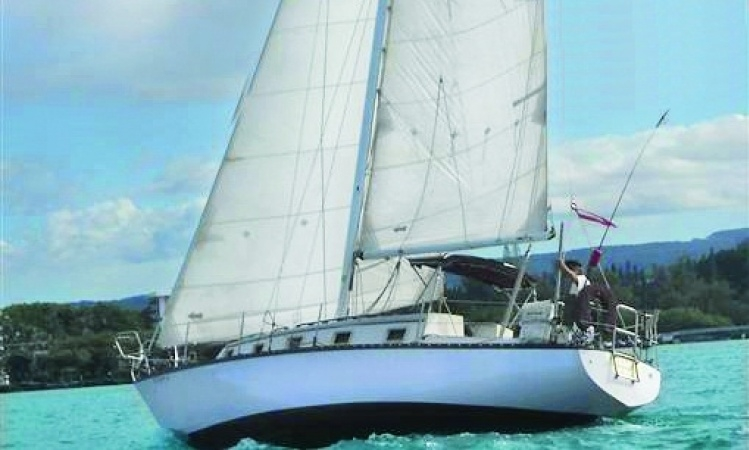 While some boats have an in-mast furling system — a continuous loop system that can be furled from cockpit into the mast — other designs will be less sophisticated. Your boat could also have a single line reefing system, in which the tack and clew are attached to the same line, coming down together when you trim in from the cockpit. Make sure to check what kind of reefing system your boat has at the dock before heading out. Note the luff reefing line, just above the tack of the main, threaded through the luff reef cringle, and the clew reefing line, threaded through the clew reef cringle. You'll use these to tighten up the sail once it's been lowered. If your boat doesn't have these lines, locate the gear that will allow you to fasten the luff cringle to the boat — it could be a hook, horn, or another device. If reefing lines are lead back to the cockpit, make sure you identify each line, and what it does. Discuss the reefing process with your crew at the dock. Sailing into a thunderstorm or high winds with new crew is not the time for an introductory lesson. 1. As you turn the boat into the wind, throttle your engine down until you have just enough forward motion to maintain control, keeping the boat head to wind. 2. Release the mainsheet completely and ease the boom vang. 3. Keeping a single wrap around a winch, ease the main halyard to lower the tack of the sail to your reef point. It may help to pull the luff down as you're easing the halyard. 4. Secure the new mainsail tack to the boom, either by inserting the reefing hook into the tack reef cringle on the sail, or trimming in hard on the tack reefing line. 5. Using a winch, hoist the main halyard to apply tension to the luff first. When you see a vertical crease appear along the luff, that should be enough tension. 6. Next, tighten the clew reefing line. It may be at the outboard end of the boom, or lead forward to mid-boom. The reefing line should pull diagonally on the new clew, down and back. Put as much tension on it as you can. The main should show a horizontal fold, parallel to the boom. Make sure that the reef lines are secure, not slipping. Keeping all reefing lines taught will help the foot of the sail stay as flat as possible. Because the clew reef should be secured as close to the boom as possible, in addition to the clew reefing line, consider running a separate line through the clew cringle and tying it directly to the boom. What to Do With the Extra Sail? After reefing, the extra sail will be shaking or flogging along the boom. Do not tie the excess off unless it is a problem. The two or three inside reef points are not reinforced to hold a load. Should your reef lines loosen, the pressure will be on the much weaker inside reef points, and your sail will tear. On sailboats, it's usually a good idea to have a basic understanding of how to do something before you need to do it. Practice reefing the mainsail in a harbor or while tied to a dock. Make sure your crew knows what to do. Communicate. The more planning you do, the less likely you are to rip the mainsail when the wind is howling and the time for practice is over.